Register your player for the 2018/19 season. Birth years 2000-2003, with Tryouts the first week of March. Temecula United's Annual General Meeting (AGM) will be held February 21, 2018 at Anselmo Investment Offices in Temecula at 6:00 p.m. All are invited to attend, and members will be allowed a vote on any elections that occur during the meeting. 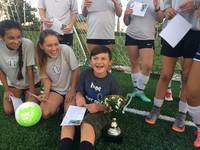 Temecula charities win with donations by winning teams through Temecula United Charity Cup tournament. The Soccer Club announces the first ever Temecula United Charity Cup Tournament will be held August 12 -13. Glendora Based Legends Football Club shares loss of two coaches lost in Memorial Day collision between car and semi-truck that killed four.